Young and gorgeous but more keen to let her work speak for her than her appearance, actress Shraddha Kapoor agrees “beauty lies in the eyes of beholder” and she will not be hassled if she is photographed without make-up. “There were many times when I am out and I don’t know whether there is a photographer or not and I am caught without make-up. I am comfortable being shot without make-up. I think you have to be comfortable with your own skin and then make-up or no make-up, it won’t bother you much,” added the Ek Villain fame actress, who walked for Lakme Absolute Sculpt Show on the first day of Summer-Resort 2015 edition of Lakme Fashion Week. The 26-year-old actress looked ravishing in off shoulder gown matched perfectly with pink lip shade. 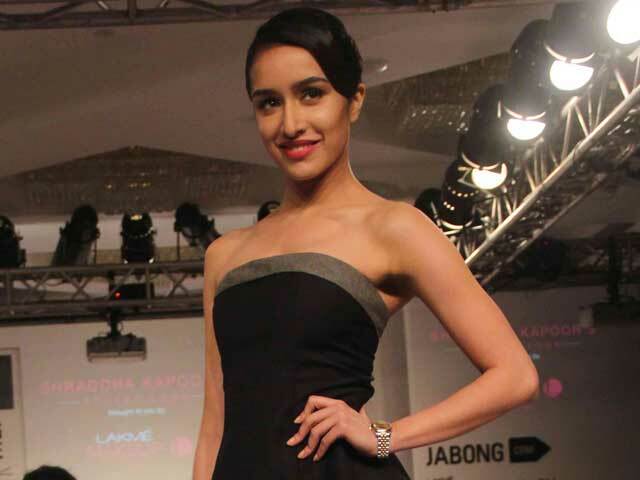 Shraddha feels that “make-up is very special moment in every girl’s life” and recalls the time when she put on it first to attend an annual function during her childhood days. “I was very young when I tried make-up for the first time. I was in junior KG class when I attended an annual function. There was a qawwali song with bunch of girls and I saw the pink shade of lipstick that my mom always used to wear. I was waiting to wear that lipstick and have some make up and blush. I have the picture of that day too and that’s when I was allowed to wear make-up,” said the daughter of actor Shakti Kapoor. Shraddha, who began her Bollywood journey with films like Teen Patti and Luv Ka The End, made it big with Aashiqui 2 and Ek Villain.